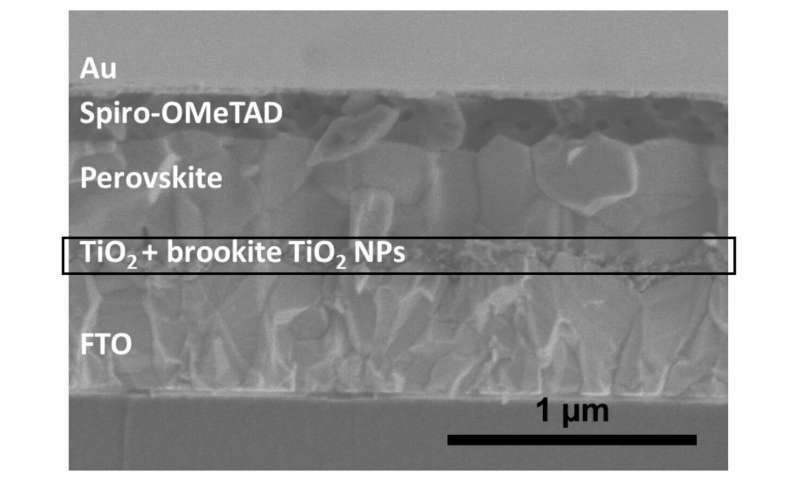 Researchers have layered different mineral forms of titanium oxide on top of one another to improve perovskite-type solar cell efficiency by one-sixth. The titanium oxide layer was better able to transport electrons from the center of the cell to its electrodes. This novel approach could be used to fabricate even more efficient perovskite-type solar cells in the future. While most solar cells are made of silicon, such cells are difficult to manufacture, requiring vacuum chambers and temperatures above 1000 °C. Research efforts have therefore recently focused on a new type of solar cell, based on metal halide perovskites. Perovskite solutions can be inexpensively printed to create more efficient, inexpensive solar cells. In solar cells perovskites can turn light into electricity—but they have to be sandwiched between a negative and positive electrode. One of these electrodes has to be transparent, however, to allow the sun’s light to reach the perovskites. Not only that, any other materials used to help charges flow from the perovskites to the electrode must also be transparent. Researchers have previously found that thin layers of titanium oxide are both transparent and able to transport electrons to the electrode. 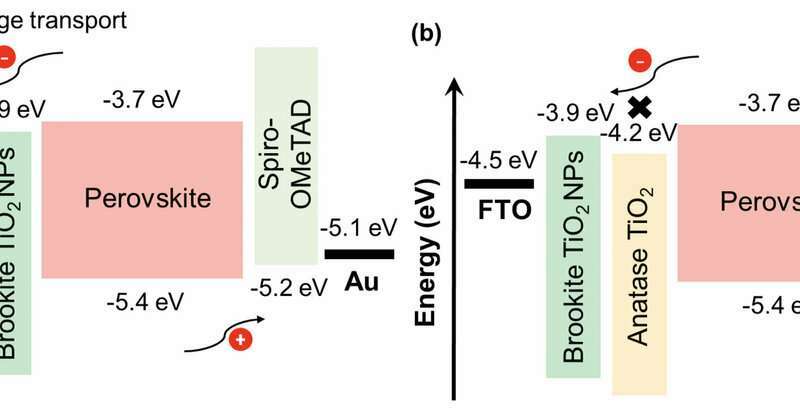 Now, a Japan-based research team centered at Kanazawa University has carried out a more detailed study into perovskite solar cells using electron transport layers made of anatase and brookite, which are different mineral forms of titanium oxide. They compared the impact of using either pure anatase or brookite or combination layers (anatase on top of brookite or brookite on top of anatase). The team’s study was recently published in the ACS journal Nano Letters. J-V curves of PSCs with FTO-A, FTO-B, FTO-AB, and FTO-BA as the ETL. Inset images: STEM image of brookite TiO2 NPs, brookite dispersion and crystallographic structure of brookite TiO2 with highlighted TiO6 polyhedral (blue and red atoms represent titanium and oxygen, respectively). The anatase layers were fabricated by spraying solutions onto glass coated with a transparent electrode that was heated to 450 °C. 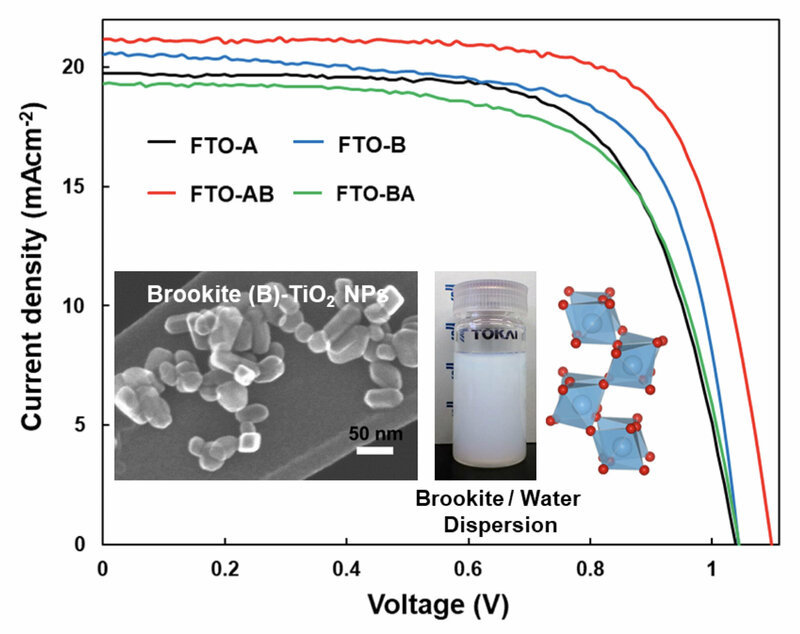 Meanwhile, the researchers used water-soluble brookite nanoparticles to create the brookite layers, as water-soluble inks are more environmentally friendly than conventional inks. These nanoparticles have been yielded poor results in the past; however, the team predicted that combination layers would solve the issues previously encountered when using the nanoparticles. 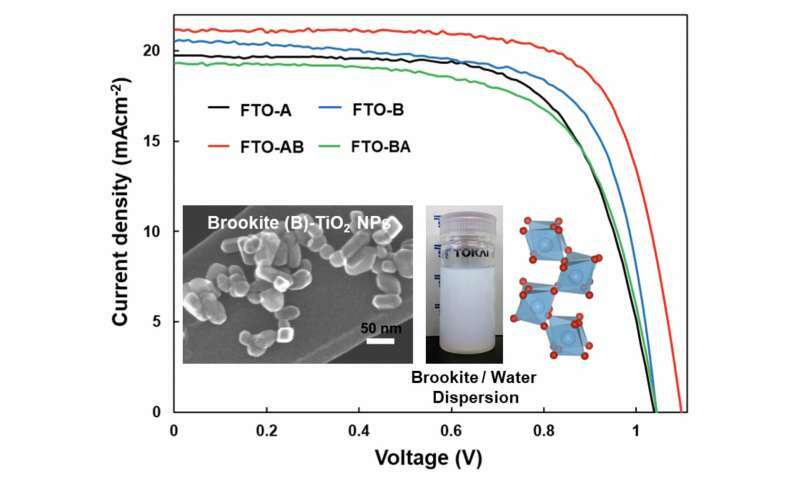 “By layering brookite on top of anatase we were able to improve solar cell efficiency by up to 16.82%,” study coauthor Koji Tomita says. 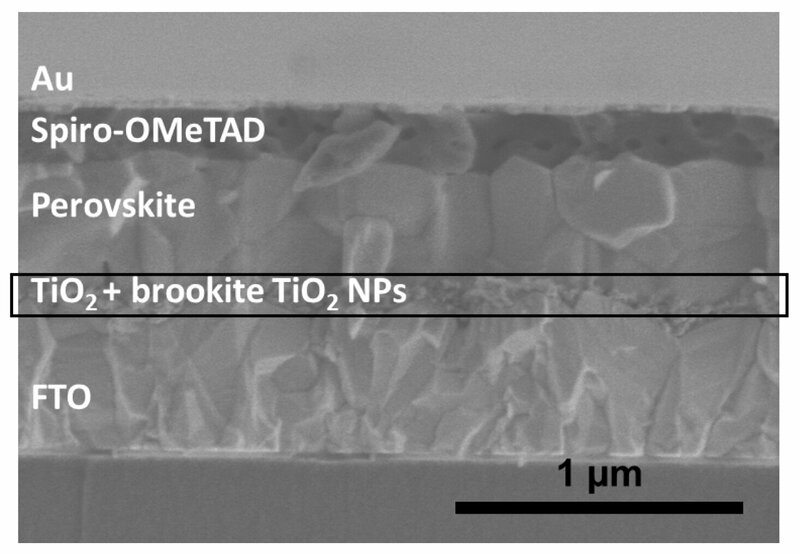 These results open up a new way to optimize perovskite solar cells, namely via the controlled stacking and manipulation of the different mineral forms of titanium oxide. Understanding how to create more efficient perovskite solar cells is important for developing a new generation of printable, low-cost solar cells that could provide affordable clean energy in the future.